Trepanation is one of the few techniques still used, but today is much more safe, reliable, and effective. 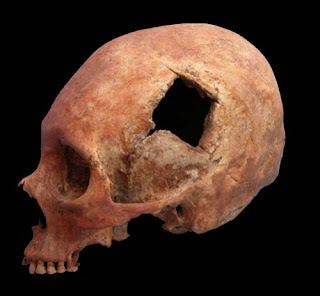 Trepanation involves scraping or drilling a hole into the skull in order to expose the dura mater. The purpose of this is to relieve pressure and treat ailments such as intracranial diseases. It is said that this technique has been used since the Neolithic times to cure migraines, epileptic seizures, and many mental disorders. In past times, it was believed that this healing technique could cure any disease, since mysticism was highly popular during those times, and many believed that the hole would allow the demons or evil spirits to escape. Trepanation was also used as a type of surgery to get rid of fractured pieces of bone after a head injury or wound. Today, this procedure, often called craniotomy, is used to treat epidural and subdural hematomas as well as a way to access the brain for neurological procedures.